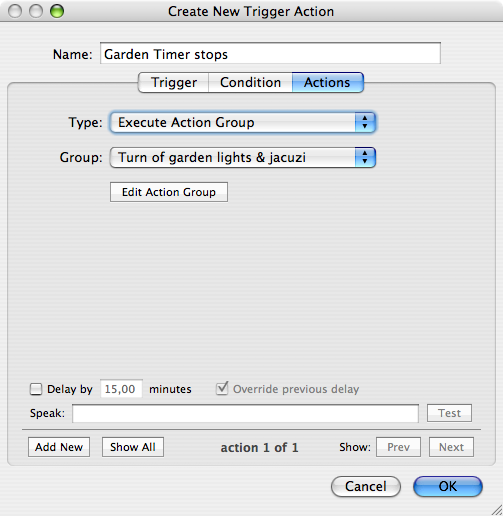 Here's a story about how I solved a problem with delays and action groups. It starts with a boring explanation on the problem itself and then introduces the concept of timers, followed by the code needed to implement them. I'm using a couple of motion sensors to switch lights on when it's dark. Switching lights off happens when the motion sensor says there is no motion anymore. Sounds simple, but it isn't. I use a W800RF32 which gives dozens of "undefined byte from w800rf interface" per day. And sometimes these messages appear instead of the message from a motion sensor saying there is no motion. So Indigo doesn't get this info and the lights will not go off. Besides that, I don't let the motion sensor switch off the light. I let it execute an action group instead. This action group switches off the light and does some other stuff. Adding a delay to an action group is a nice feature, but unfortunately, it is not possible to remove delayed actions for an action group. That part only works for devices and triggers. So once the delayed action group is set, it will go off. No matter what I do. This means lights will go out, even if new motion has been detected. What can be done to solve this? Then I started thinking about a solution. What I really need is an independent "something" that gets started when there is motion and stops when there hasn't been motion for a certain period of time. Whenever there is new motion, the "something" has to start again. And only when the motion really has stopped, it should execute an action group. This "something" I need is actually a timer. When motion is detected, it gets set at a desired timeframe (in seconds). A background process decreases the timer and when it reaches 0, the action group is fired. When the motion sensor detects motion again, the timer is reset to it's start value. 1. I don't need the motion sensor to send a "no motion signal" anymore, so the W800RF32 errors won't interfere with my system. 2. I'm capable of changing the timer length without manually changing the timer setting in the motion sensor itself. What is needed to implement a Timer? 1. A variable "Timer<name>" that will hold the current timer value. 2. A trigger that sets the variable "Timer<name>" to it's start value whenever motion is detected. 4. A background task that decreases the value of "Timer<name>"
5. A trigger that starts this background task when the Indigo Server starts. Steps 1, 2 and 3 are basic Indigo stuff, so I won't go into detail on them. Step 4 is the fun part: the background task. Get all variables from Indigo whose names begin with "Timer". If the value of such a variable is bigger than 0, decrease it by 15 seconds. After all variables have been decreased, wait 15 seconds. So here's the code for the timer script. To use it, copy it into the ScriptEditor and save it in Indigo's backgroud task folder. -- Retrieve Timer variables from Indigo and count them down. -- means to not use it. -- But when a timer counts down below zero, fix it at zero. log "Timer '" + theTimer + "' time out occured" using type "error"
log "Timer '" + theTimer + "' error occured: " & errNum using type "error"
log "Timer script heartbeat" using type "info"
log "Timer loop time out occured" using type "error"
log "Timer loop error occured: " & errNum using type "error"
-- This is the most important part of this script. log "Timer main loop time out occured" using type "error"
log "Timer main loop error occured: " & errNum using type "error"
This script needs to be started whenever the Indigo server is started. To get this done, define a new trigger "Indigo Server Startup" with a type "Indigo Server Startup". No condition needed, always fire this trigger. And the action is to execute AppleScript in a file. Select the Timer script from above that you placed in the Background Tasks folder. To start the script, you can restart the Indigo server or just execute the trigger. Testing the script is easy: define a variable "Timer<something>" and give it a value of "40". If everything works well, you'll see the variable go to "25", then "10" and finally "0". You can define as many timers as you want, as long as the name begins with "Timer". All you have to do to add a new timer is to define a variable "Timer<newname>", a trigger that sets the start value and a trigger that executes when "Timer<newname>" reaches 0. I've been using timers for about a month by now and it is working ok. No more wondering if the lights will go out. They will. And they will only go out when there has been no more motion for a while. The only strange problem I had was the timer script stopping without a reason. After debugging I found I needed an extra loop in the AppleScript code, as you can see in the code above. If anyone knows why this is happening, please let me know. Last edited by macpro on Sun Aug 05, 2007 9:23 am, edited 1 time in total. Indigo's time-date actions can be used as timers. They can be created or destroyed on the fly. You just have to worry about their names (make sure they are unique). set myDelay to value of variable "My_Delay"
set script code to "MyTimeout()"
Good to get some feedback on this topic. The main difference between your approach and mine is that I have provided a generic solution that needs no coding to add new timers. Do you think you can change your solution so it is reusable for multiple timers? But what if you need to restart an already running timer? How would you do that in your solution? The drawback of this approach is that you need to write your action in AppleScript. And you need a piece of code for every timer you define. By using a variable, I can define a trigger in Indigo that acts upon the change of value of that variable and use standard Indigo features to react. Kevin asked if I could give more details on the first steps for setting up timers. So here's an example for setting up a timer in Indigo, after you have configured your Indigo environment for timers as described above. Let's say the lights and jacuzi in the garden should stay on as long as there is some movement in the garden. 15 minutes after the last movement, an action group should fire that switches of the lights and jacuzi. Define a variable in Indigo. Let's call it TimerGarden and give it a value of 0. Defining a variable with a name that starts with "Timer" is all you need to do to create a new timer. 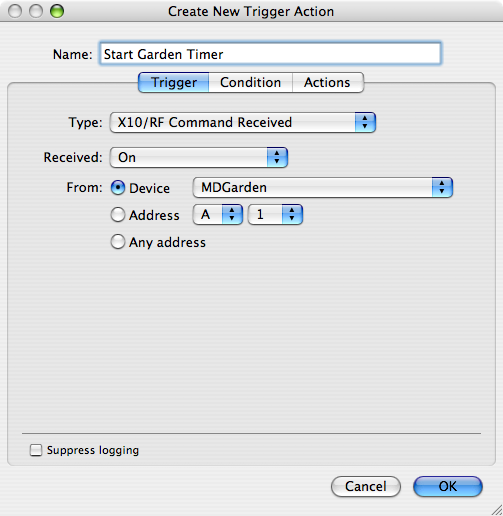 Define a trigger that's fires whenever the motion detector MDGarden is activated. 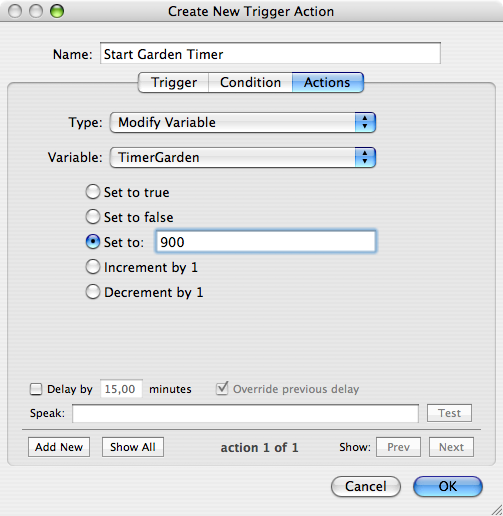 This trigger sets the value of TimerGarden to 900. That's 15 minutes specified in seconds. Don't worry about conditions for this trigger. Just let it fire every time motion is detected and it wil reset TimerGarden back to 15 minutes. Define a trigger that fires when the variable TimerGarden reaches 0. As soon as that happens, there hasn't been any motion in the garden for 15 minutes. And then it's time to execute the action group that will turn of the lights and jacuzi. I've left the details for the action group out of this example. You can imagine that this action group would switch at least two devices off. That's all you need to do to get a new timer working. 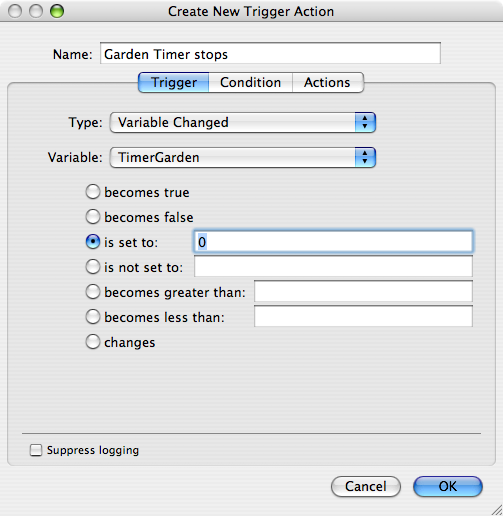 The process of decreasing the variable TimerGarden is done in the background. So you don't have to worry about that. Great. Step-by-step tutorial complete with screen shots. Thanks! Edit: I posted a stupid question without reading the whole thread. I started off with nothing...I still have most of it left. 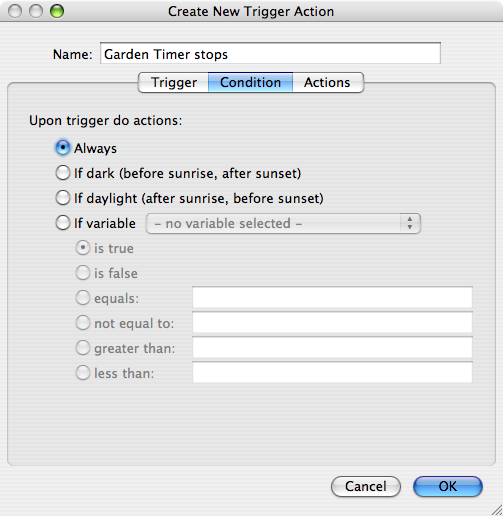 Thru a control page button that will run an applescript to enable or disable the particular times to run or not run the selected TDA. How can I post on the control page that it is enabled or disabled? Say, as a variable image dot? How can I post on the control page that it is enabled or disabled? Say, as a variable image dot? set value of variable "fooEnableState" to enabled of time date action "My Foo Time Date Action"
Maybe I am reading this post wrong. if motion from A1 turn on lights, auto off after 5 minutes. If there is motion within the 5 minutes the timer is reset by indigo again and again. No motion for 5 minutes and the lights are off. If you just want to switch off lights, that approach works. But if you want to execute action groups when there is no motion after a certain period of time, you'll have to use something else. That is why I came to this solution. The subject of the topic is to automatically switch off lights after a certain period of time. But with the ability to increase the timer interval via buttons and an automatic decrease of the timer interval after a couple of days. I have a question about the solution proposed by Wikner. When the time date action is created the "set script code to "MyTimeOut()" appears to requires an applescript string containing code. How do you past in a reference to a function/subroutine? I've attempted to implement your solution and could not get it to work by specifying a function in the "set script code" statement. I had to put the entire code which would have in the MyTimeOut() routine inline. Then, choose the Scripts->Reload Attachments menu item. Your function, MyTimeout(), will then be loaded into Indigo's main script context and you will be able to call it from a dynamically created Time/Date Action. I'm building an Applescript that essentially does for Airfoil what the applescript attachment "iTunes sync.scpt" does for iTunes -- namely control Airfoil and sync Indigo variables with Airfoil. In this case, AF_SpeakersOFF is a subroutine that will be called in one hour that is designed to turn off the speaker named dakar. Note my subroutine below converts the single quote to double quote that Applescript will understand. By individually naming each timer (in this case "dakar_MyTimer") you should be able to easily have multiple timers and be able to access their properties (to display the time left for a counter, for example). If you don't want to pass the Applescript directly, you could implement the MyTimeout subroutine as shown by winkner, but pass the variable name into it, and have if/then statements look for the variable name. For my purposes, passing the applescript was more direct and less complicated. Oh, and I forgot to mention, if the code is called again while the timer is running, it'll automatically reset the timer. One could modify this to add a set time to the current time, rather than resetting it. it will not reset itself to the value of variable "My_Delay" when the timer is triggered again while it is running. From looking at the "next action indicator" in Indigo's main window the timer appears to run out to zero then start again. If motion is detected while the Timer is running the "next action indicator" in Indigo's main window resets to the time remaining on the present timing action. How can I have the Timer reset to to the value of variable "My_Delay" every time motion is detected? Can the variable "My_Delay" be made to show the countdown in the Variables window?